Suzy's Blog: What have we here? A lovely package arrived in the post yesterday. I opened it up and a whole bunch of tubes fell out. What sort of tubes could they be? Columbus Spirit for lugs, of course, in OS. This stuff is about the pinnacle of tubing. All Nivacrom, lovely thin walls, but with friendly butted sections suited for lugged construction. More of the package revealed some lugs. These are Llewellyn custodian lugs, in OS size, and in stainless. Keith is a really good mate from way back - He's the sort of guy that's just perfect to sit on - a big hefty sprinter. I've watched his arse for many thousands of kilometres, which is as it should be, because the alternative is not being able to get on his wheel when he decides to sprint. Keith surprisingly has very short legs. He's a reasonably tall boy, but clearly all his height is in his torso. His off-the-peg Pinarello is a 54, which has a 52 seat tube and 54 top tube. In order to fit on it, he needs a 13cm stem and he pushes the saddle all the way back (9cm from saddle tip to BB), which can't be good for his knees. I went for a 53cm seat tube (about the same standover height as his Pinarello), but put an extra 3cm in the top tube, for 57cm. 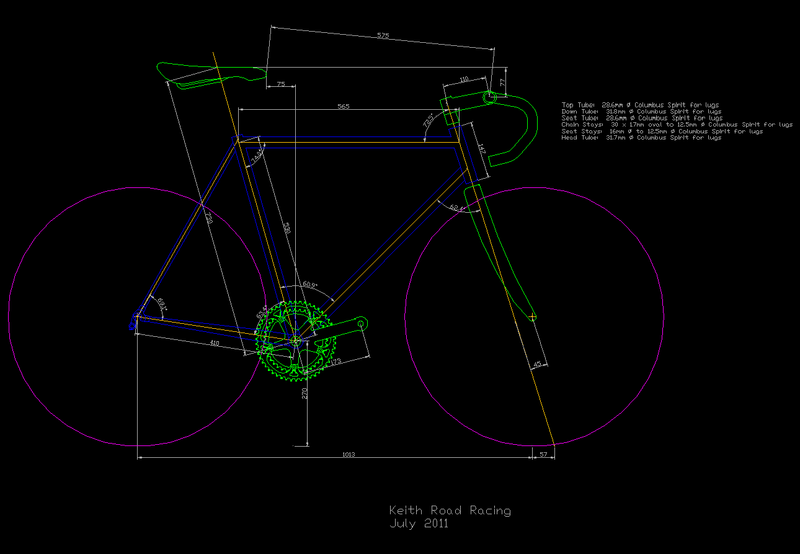 This allows him to use an 11cm stem and just 7.5cm saddle setback, but get the same saddle-bar distance. The hope is that he'll be more comfortable and more able to get over the pedals when he sprints. I've set the bar drop the same as his Pinarello - 7.7cm, but allowed provision for him to drop the bars significantly once he gets used to the slightly more aggressive geometry. Dazza was aghast that I ordered stainless lugs without ordering the parts for a fork as well, so I've relented and will do a matching fork. This is using parts I've had kicking around for a while - a 1" Columbus EL steerer, Columbus Nivacrom blades, and a Long Shen stainless crown (which I've already polished up). This should build up a lovely light fork. Head tube: Columbus Nivacrom 31.7mm. Seat stays: Columbus Spirit 16mm, tapering to 12.5mm tips. Chain stays: Columbus Spirit 30mm x 17mm oval, tapering to 12.5mm tips. Dropouts: Llewellyn LRD68/SS stainless, 68 degree angle. Front derailleur tab: Richard Sachs. Lugs: Llewellyn Custodian stainless OS. STI bosses: Llewellyn LL-09-31.7 with Ceeway brass deluxe STI adjuster screws. The head lugs, crown, dropouts, derailleur tab and STI bosses will all be polished. I'm still vaccilating as to whether or not to polish the seat lug. If I do, I'll really have to change my usual fastback seat stay attachment style... Anyway, I'll see. In the meantime I'll get to carving the lugs. Suzy - just came across your post. I was wondering where you managed to get the blocks (?) for handlebars, stems, etc. 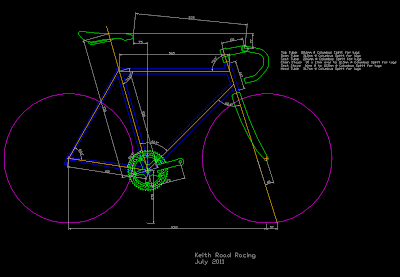 in your CAD files? Also, thanks for pointing your readers to Draftsight - I'll be giving it a go. I just draw the stuff myself. Bear in mind they aren't terribly accurate, as I'm not making them, so they're only supposed to give an imnpression of what the bike looks like.